I’m writing from the sailboat’s quiet salon, one of those rare moments when you’re all alone on the boat when you’re actually not all alone on the boat. Everyone is still knocked out cold in their cabins after getting to bed quite late again last night. It’s hardly early morning, though. Rather, approaching lunchtime in the “real world.” But the Barba crew remains on their own times and terms in this surreal place and season we´re sailing through. I cherish these moments, left with just my thoughts and these vast people-less views that will all too soon be gone with our wake. Just a few days ago we were truly north. Adrift in the pack ice. And for a brief moment, Barba and the five of us were a part of the edge of the top of the world. Imagine. We made it above 81 degrees North. A feat celebrated first by Ivan, who was alone on watch when the GPS registered N 81 00.000’ and proceeded to barge into our cabins with the GoPro at 4AM while cackling, somewhat maniacally, “81 degrees!!! Ha ha ha, 81 degrees, guys! We made it to 81 degrees north!” The rest of us got more excited about it all when, a few hours later during my watch, we finally spotted the polar ice floes piling up on the horizon. We’d made the final decision to head north toward the pack ice – the frozen sea ice surrounding the North Pole – the night before in Sjuøyane, the Seven Islands archipelago that is the northernmost part of Svalbard. There in the bay, we had a serendipitous meeting with a small expedition cruise ship. Andreas had gotten on channel 69 to ask the captain if he had been up to the ice that day so we could gauge conditions for an approach. “Yes, I can come over to tell you about it,” came the reply from the other ship´s captain in a strong French accent. The Barba crew sprang into a flurry of activity below deck, smoothing beards and sniffing underarms to make sure we were presentable. Humans! We were going to see other people after two weeks of the same faces. We ended up mooring up alongside the Marseilles-registered M/V Polaris, a former cargo ship rescued from a deteriorating state in a Scottish harbor a few years back and transformed into a very fine cruise ship for just 12 pampered passengers. The crew of five, all of whom looked to be younger than 30 and spoke impeccable English, were happy to see some new faces, too. So we joined them on the Polaris bridge for some cold Arctic beers and conversation. When the captain offered us the chance to shower I nearly keeled over with joy and the boys were happy, too. There was lots of Vive La France-ing going around. It had been two weeks by now since warm water had flowed over our bodies. The Barba boys, gentlemen sailors that they are, granted me first rights. And we invited the Polaris crew back to Barba for Ivan´s Arctic char roe served on Dani’s delicious homemade rosemary focaccia. Rum from Panama and other worldly spirits were passed around to the tune of Joe Dassin and old Russian sailing songs. We forgot for a moment that we wanted to head to the ice, I think, so pleased were we to have some new people to interact with. But the Polaris crew had to be up early the next morning to head back toward Longyearbyen. So when they shimmied back up the hanging ladder to their ship we made the decision to head off right then at 11PM and make our way north toward the ice. The next morning at 7AM, when Ivan woke me for my watch, I was surprised that there was still no ice around us – just calm seas and a low layer of fog huddled on the horizon. We had expected to meet the floes a lot sooner as the French captain had told us they’d found themselves ice-bound just a few hours north of Sjuøyane. But we had taken a course a bit to the west to make sure we could get to 81 degrees before reaching the thick of it. So now we decided to chart a more northeasterly course to where the closely-packed ice appeared on the maps. It was a good hour farther along, however, before my binoculars finally revealed what looked like jumbled floes on the horizon. Finally, the pack ice! 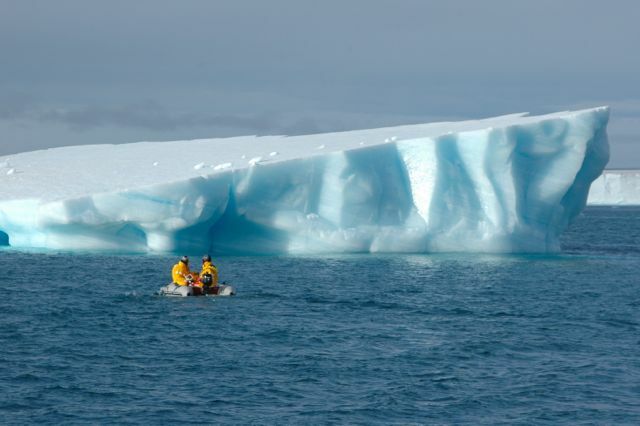 We had made it to the skirting edge of the north pole in our fiberglass boat. What a feeling. And then it wasn’t long at all before little growlers were passing too close for comfort by Barba, so I woke Jon up for some help. By the time he had gotten dressed we were nearly surrounded by sizable floes that were assembling around us like jigsaw pieces pushed by an invisible hand. We moved steadily through the open waters around the ice for a while, Jon enjoying the zig-zag navigating and the rest of us scouting for polar bears and seals on the floes. 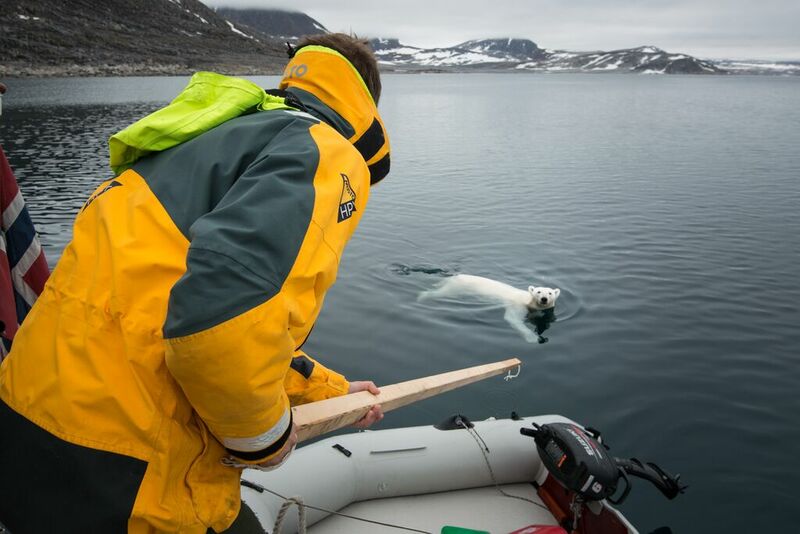 Only Jon saw a polar bear moving along a large floe at one point, in its true natural habitat. How lucky is he!? But by the time he put down the binoculars to point it out to the rest of us it had vanished into the mist. At some point we decided to moor up alongside a low ice floe the size of a basketball court and Jon stepped “ashore” to set up the drone while Andreas and I suited up for a dive. But we were all moving a bit too slow or perhaps enjoying the scenery a bit too much, and before we knew it the ice around us had closed in, the puzzle pieces locked into shape. We were effectively stuck in the ice. A radar view turned completely red drove home the point. We all knew the implications of this. 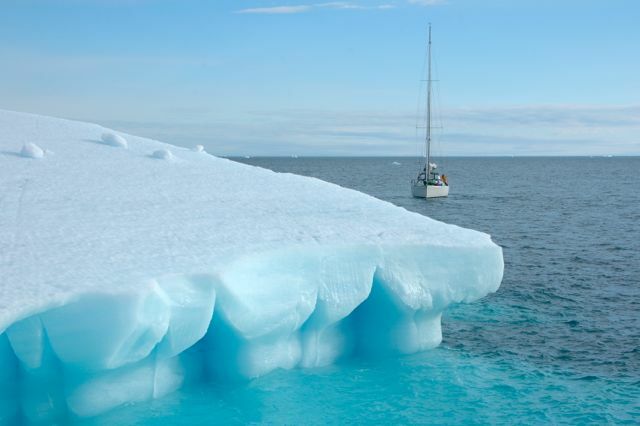 Boats with hulls far sturdier than Barba´s have suffered the slow squeeze of death in the polar pack ice. The wind shifts direction and suddenly you´re socked in. 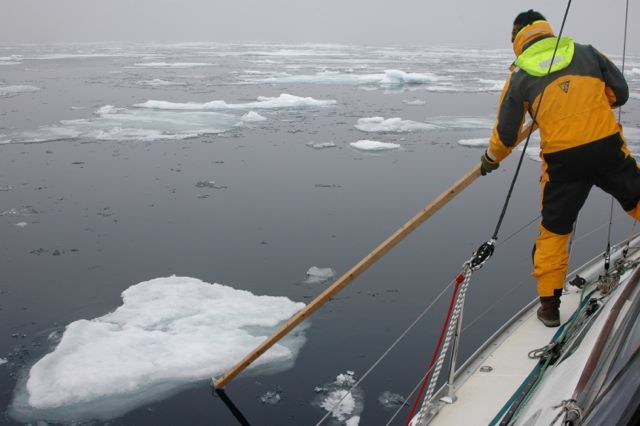 So we sprang into action, grabbing the ice poles and sending Dani up the mast to scout for a route out. It took a good hour of hopping from starboard to port and pushing ice away from Barba’s hull with the metal and wooden poles, with the boat groaning in low gear, lots of reversing and some rather unpleasant noises on the hull (to the captain´s great concern). 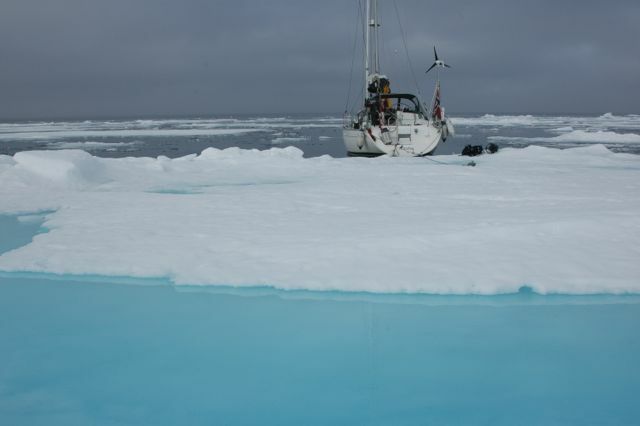 But we eventually made it into the clear, where we promptly moored alongside another floe and again got ready to dive. 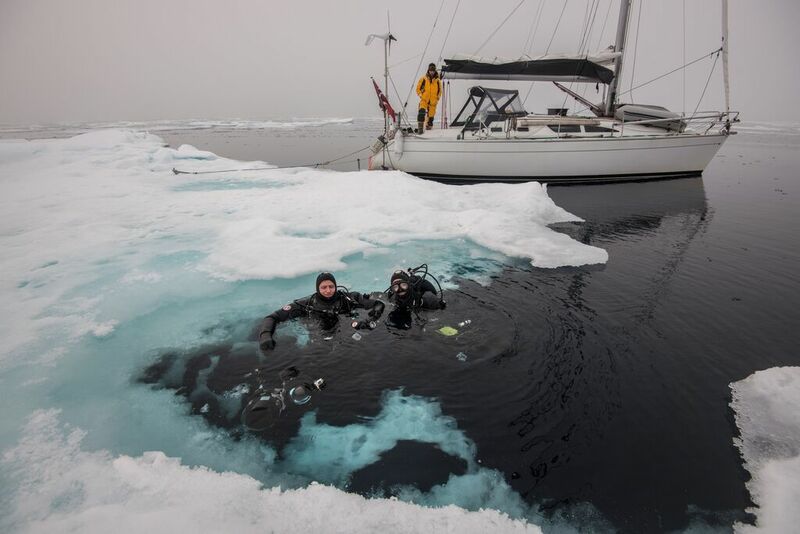 Preparing to dive in the pack ice in the Arctic is a bit out of my comfort zone. A Florida girl used to thin wetsuits and colorful reefs washed with bathtub-temperature water, I had invested in a fancy new dry suit (Santi, “the Rolls Royce of dry suits,” says Andreas) especially for diving along the Norwegian coast and in Svalbard. But if I wasn’t going to use the thing for the chance to see the underside of an ice floe then when was I going to use it? As we layered on the thermal undergarments (for me that means three pairs of wool socks, two layers of merino long underwear and a sleeping bag-like sheath over it all) and zipped into the water-tight shell, I wasn’t even worrying about the water temperature. I was considering how closely I would resemble a seal on the ice, and replaying certain YouTube videos in my mind of stealthy polar bears ambushing seals, ninja-style, on floes that looked identical to the piece we were perched on. Jon assured me he’d be watching with binoculars from all angles on deck. And we made a plan that if he saw a bear anywhere in the vicinity while we were diving he would toss an explosive off the bow to warn us. Just what we would do with that information underwater I wasn’t really sure, but Jon has the kind of calm and confidence that makes me feel secure in most any situation. And of course Andreas was hardly worried, ex-military diver that he is. So in we went, stepping off the edge of the ice (or sliding, seal-like, in my case) into water a Bahamian shade of turquoise. Our dive computers registered a water temperature of -1 degrees Celsius, just above the point at which high-salinity sea water freezes. My eyes widened at the soup of life just under the surface. Thick clouds of krill swarmed like gnats and boxy jellyfish dragging thin ruby red tentacles floated past. It was the dream-like world I´d only seen before in nature documentaries, this subsurface domain of the seals, diving birds and stalking bears. From beneath, the ice floe looked like a mountain range tipped on its peaks. We dived under it and then circled the edge of the floe, surfacing not too long after since the underwater scooter was out of juice. 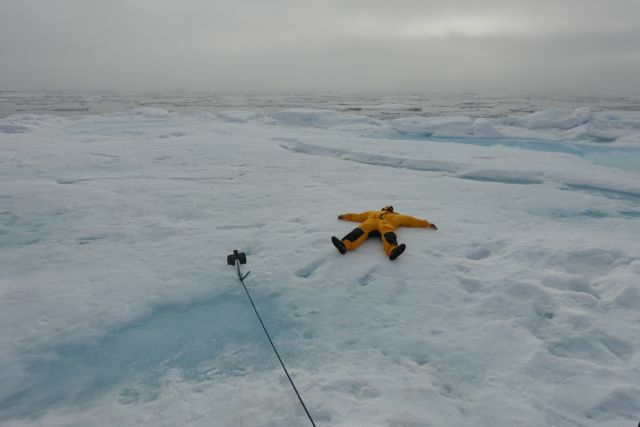 When I lugged myself back up onto the snow-packed surface of the ice it felt warm through my drysuit, if that was possible. Even beach-like, I would say. I don’t think any of us wanted to leave our icy flyte brygge (floating dock) and this white-washed world where the ocean breathed in deep inhalations, lifting the floes in hypnotic slow motion. 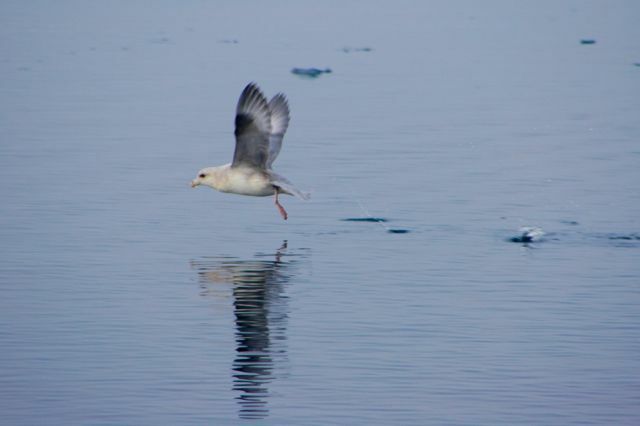 All around us, northern fulmars banked perpendicular to the water, tracing the points of their wingtips through the glassy surface like surfers carving a turn. The only sound was water sloshing and sucking, and the slow grind of one floe up against another. Dani donned his lederhosen and we went out onto the ice to toast the sheer feat of being here with some squirreled-away dried ham he´d been saving and peppermint schnapps from South Tirol. Then I took one last wander to the floe’s edge to listen to the sea lapping the underside of the ice, slowly taking it back. I wanted to remember this moment, how far we´d come and where we were. And how much we’d relied on eachother, too, to get here. I wanted to remember how lonely and off the charts some rare places really are. The weather would be changing soon and it was time to go. What followed was a most unpleasant sail south that was meant to be only about 14 hours but somehow turned into 29 hours due to relentless headwinds and a well-offshore course meant to steer us clear of uncharted and potentially shallow waters. If we weren´t on watch getting a face full of sea spray and being blasted with icy winds we were horizontal in our cabins. And by the time we finally made it back to the anchorage at Kinnvika the clock told us it was 2AM on god knows which day. The cloud-dimmed sun was in more or less the same position as it always is during the Arctic summer, neither too high nor too low in the sky. We were just relieved the transit was over and we’d made it in and out of the polar ice safely. The winds were still howling so we had anchor watch through the night to make sure Barba wouldn’t free herself and go walkabout while the crew slept. We warmed ourselves with thoughts of the sauna we’d spotted a few days earlier inside a wooden building at the abandoned research village onshore. But the next day when we woke up, ready to head ashore and fire up the chimney, a polar bear was lollygagging along the shoreline, sniffing everything in sight and unwittingly holding us hostage on the boat. Another reminder that you can’t really plan for anything in these parts. You can read more on the Barba sailboat blog, here.